Amélie Simone Mauresmo (French pronunciation: ​[ameli simɔn moʁɛsmo]; born 5 July 1979) is a French former professional tennis player, and former world No. 1. Mauresmo won two Grand Slam singles titles at the Australian Open and at Wimbledon, and also won a Silver Medal at the 2004 Summer Olympics. After the defeat of Davenport at the Australian Open, Mauresmo, 19 at the time, came out as gay to the international press. She "attributed her success on the court to coming to terms with her sexuality and finding love." At the US Open, Mauresmo lost to Sharapova in the semifinals 0–6, 6–4, 0–6. This was the first time in the open era that a female had lost two sets at love in a US Open semifinal. At Wimbledon, Mauresmo lost in the third round to two-time former champion Serena Williams, 6–7(5), 1–6. Hampered by a thigh injury, Mauresmo trailed 5–0 in the second set before breaking Williams's serve, only to be broken herself in the next game and lose the match. Mauresmo said after the match, "I was not 100% in my movement but overall I thought there were some good moments in the first set. But I really started to feel the injury in the tiebreak, and I'm not going to talk about the second set." Mauresmo, after a two-month hiatus from tennis due to a thigh injury sustained at Wimbledon, lost in the semifinals of the Western & Southern Financial Group Women's Open in Cincinnati, Ohio to Nathalie Dechy, 4–6, 6–3, 2–6. After the match, Mauresmo, sounding optimistic about her chances at the upcoming US Open, said "I got four matches in this week, which is what I was looking for. It would have been great to play five but I'll go to New Haven (Connecticut) hoping to find a little more rhythm and build up to the US Open." Mauresmo then lost in the semifinals of the Pilot Pen Tennis tournament (in New Haven) to top-seeded Chakvetadze 6–3, 3–6, 6–1. At the US Open, Mauresmo lost in the fourth round to 16th-seeded Flavia Pennetta 6–3, 6–0. Mauresmo was the 17th seed at the 2009 Wimbledon Championships. She opened with a 6–1, 4–6, 6–2 win over Melinda Czink. She then defeated Kristína Kučová and Flavia Pennetta. Her fourth round match against the first seed Dinara Safina became a part of tennis history as it was the first competitive match in which the new, multimillion-pound roof closed due to rain. Mauresmo went on to lose the match, 6–4, 3–6, 4–6. Mauresmo announced at a press conference on 8 October 2009 that she was considering retiring from tennis. On 3 December 2009, she officially announced her retirement from tennis at a press conference in Paris. She ended her career ranked World No. 21. In 2013, Mauresmo started coaching French No. 1 Marion Bartoli, joining forces with her shortly before the 2013 Wimbledon Championships. Under her tutelage, Bartoli would win her first Grand Slam title there without dropping a set (or even playing a tiebreak set), and credited her for her career revival (entering these Championships, Bartoli had yet to even reach a semi-final in 2013). On 8 June 2014, Mauresmo was announced as the new coach of Andy Murray. In December the FFT announced that it was extending Mauresmo's Fed Cup contract for another two years. Under her coaching Murray reached the Australian Open final but he lost to Novak Djokovic in four sets. In May 2015, Mauresmo oversaw Murray's first career titles on clay, including the Madrid Masters, which culminated in a first ever clay court victory over Rafael Nadal. Murray also reached the semi-finals of the French Open and Wimbledon. On 9 May 2016, Mauresmo announced that she had stepped down as Murray's coach. Simultaneously, she had captained the France Fed Cup team since 2013. After the 2016 final, which they lost to the Czech Republic, she announced she was quitting that post due to her pregnancy. In June 2018 she was appointed captain of the France Davis Cup team for the following season. Nevertheless, she never came to fulfill this position, since at the end of the year she renounced in order to coach French player Lucas Pouille during the 2019 season. Under Mauresmo's coaching, Pouille, who had never previously won a match at the Australian Open, reached the semifinals of the 2019 edition, where he lost to eventual champion Novak Djokovic. 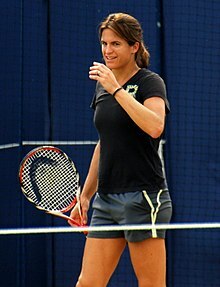 Although Mauresmo had been one of the top singles players for several years, she did not have success in winning Grand Slam tournaments until 2006. Mauresmo was criticized for her mental strength after succumbing to nerves in those events. In consecutive Wimbledon semifinals, she lost to Serena Williams and Lindsay Davenport after leading comfortably. Before her 2006 Australian Open title, Mauresmo was often touted as "the greatest women's player never to win a Grand Slam." After winning the 2006 Wimbledon title, Mauresmo openly joked, "I don't want anyone to talk about my nerves any more." Mauresmo is one of several tennis players, male or female, to have reached the top ranking without first winning a Grand Slam singles title. Other players who had done so were Kim Clijsters, Ivan Lendl, Marcelo Ríos, Jelena Janković, Dinara Safina, Caroline Wozniacki, Karolina Pliskova and Simona Halep. In April 2015, Mauresmo announced via Twitter that she was pregnant and expecting the baby in August. On 16 August 2015, it was announced that she had given birth to a baby boy. She gave birth to her daughter, Ayla, in April 2017. Mauresmo's apparel and footwear on court was manufactured by Nike, and later Reebok. In the early 2000s, she used Dunlop 200G+1.00 racquet. ^ "Serbian starlet shocks Mauresmo". BBC News. 28 May 2005. Retrieved 15 September 2012. ^ "Sharapova stops No. 1 Mauresmo, will meet Henin-Hardenne in U.S. Open final". Usatoday.com. 8 September 2006. Retrieved 4 June 2012. ^ Cheese, Caroline (27 June 2008). "Battling Serena sees off Mauresmo". BBC News. Retrieved 4 June 2012. ^ "French stars to miss the Olympics". BBC Sport. BBC. 21 July 2008. Archived from the original on 22 July 2008. Retrieved 22 July 2008. ^ "Mauresmo's title hopes ended by Dechy in Cincinnati". Uk.reuters.com. 17 August 2008. Retrieved 4 June 2012. ^ "Amelie Mauresmo splits from coach Loic Courteau". The Daily Telegraph (Sydney). Agence France-Presse. 30 September 2008. Retrieved 14 November 2010. ^ "Women's singles results". BBC News. 26 June 2007. ^ "Mauresmo calls time on her career". BBC News. 3 December 2009. Retrieved 23 April 2010. ^ Hodgkinson, By Mark. "Amelie Mauresmo retires from tennis". ^ Nguyen, Courtney (14 February 2013). "Marion Bartoli splits with father-coach, wants Amelie Mauresmo as replacement". Sports Illustrated. Retrieved 10 September 2014. ^ "Amelie Mauresmo combines Andy Murray & Fed Cup roles". 2 December 2014 – via www.bbc.co.uk. ^ Grez, Matias (9 May 2016). "Andy Murray and coach Amelie Mauresmo 'mutually agree' to end partnership". CNN. Retrieved 23 May 2016. ^ "Amelie Mauresmo steps down as France's Fed Cup captain". tennis.com. Associated Press. 14 November 2016. ^ "Amelie Mauresmo withdraws as France Davis Cup captain to coach Lucas Pouille". BBC. 6 December 2018. ^ "Australian Open 2019: Lucas Pouille praises coach Amelie Mauresmo". BBC. 23 January 2019. ^ Robson, Douglas (27 August 2006). "Mauresmo's stock can rise, fall in NYC". Usatoday.com. Retrieved 4 June 2012. ^ Crawford, Harriet (9 April 2015). "Andy Murray's coach Amelie Mauresmo announces pregnancy on Twitter: 'Baby will be here in August'". Daily Mail. Retrieved 30 June 2015. ^ "Andy Murray: Scot dedicates win to new Mum Amelie Mauresmo". CNN. 17 August 2015. ^ Tennis.com (17 August 2015). "Mauresmo gives birth to first child, a boy". ^ "Amelie Mauresmo announces birth of second child". ESPN.com. 26 April 2017. ^ "What they're wearing (and hitting with) at Wimbledon". SportsBusiness Journal. 25 June 2001. Retrieved 10 September 2014. Wikimedia Commons has media related to Amélie Mauresmo.